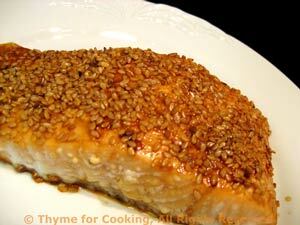 Sesame Crusted Roast Salmon, Thyme for Cooking easy gourmet dinner. This is an easy Friday night dinner with both the salmon and potatoes done in the oven. 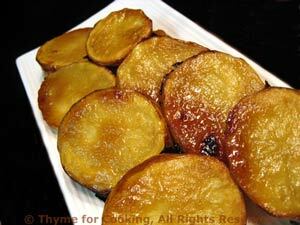 The Teriyaki Marinade caramelizes on the bottom of the chips, making a chewy crust around the edges. 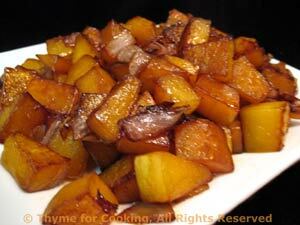 Put potato slices and Teriyaki in a bowl and stir well to coat. Lay on a nonstick baking sheet (if you have one - just makes it easier). Bake in a 400F (200C) oven for 30 minutes. Turn half way through if you like.